This herbivore may have had a dual use for its three horns and large bony frill. Undoubtedly helpful in protecting the animal from its predators like T. rex, its horns may also have been used for uprooting trees, and its frill for extra protection as the trees fell. Its powerful jaws and very coarse teeth would then vertically slice and powerfully pulverize, whole trees. 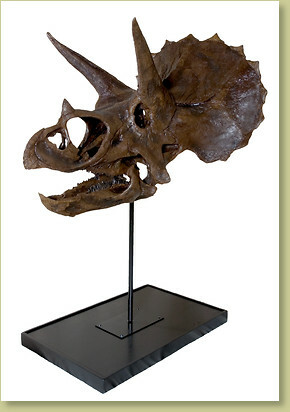 Cast from most complete disarticulated original sub-adult Triceratops skulls we've prepared! One of the beneficial aspects of disarticulated skull bones is that they retain their original shape, which makes a more "true to life" representation. What a wonderful emissary this piece will make to greet guests in a children's museum, as a part of a larger display with a T. rex and other skulls, or with other full mounts! Credit Original specimen discovered and collected by Steve Sacrison and prepared by Black Hills Institute of Geological Research, Inc.
Notes May take up to three months for production. Check with us to see if an earlier delivery is possible.